Collage calls for a uniquely different approach than, in my opinion, any other art form. While it is important to remember that many forms of art draw inspiration from other creators and mediums, collage would not exist without the presents of others works of art. 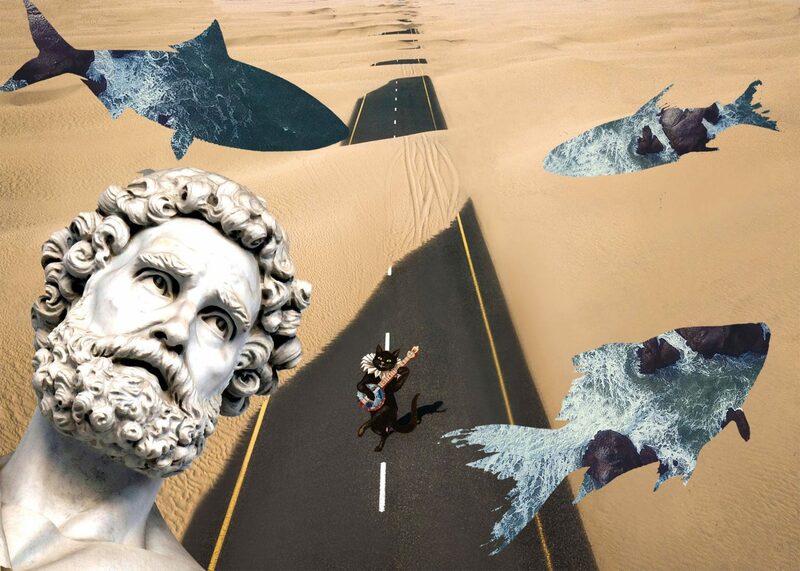 For my collage, I selected to use a picture of a marble bust and placed it against the background of a desert. I used the clipping mask tool to construct the fish outline that were later filled with an image of the ocean. They are supposed to look as though they are swimming above his head, almost taunting him because he is stuck in the dry place. I hope that when someone views my piece they initially have a sense of confusion; that the expression of the face comes across and is enhanced by the juxtaposition of a desert with flowing bits of ocean. I also wanted to play on the feeling of being disoriented. That feeling of seeing stars when you hit your head. I decided to show that with fish instead of, what is usually used, birds. Aside from clipping mask, I also utilized the magnetic lasso tool. It was instrumental in precisely cutting around the outline of all the fish and the bust. I also think it is a fun tool to use because it allows you to have a lot of control over how you choose to cut an image. Two elements of design that I feel are very prevalent in my collage are texture and contrast. I included two opposing substances, sand and water. Not only is there an inherent geographical contrast I also feel that sand is course and obviously different from the fluidity of water. And while the blue water and tan sand are drastically different from one another, neither one is incredibly different form the bust. The curly hair of the bust mimics the waves of the water, and the shadows of the sand mimics the indentation and contours of the face. Personally, I do think that this collage could have been executed in a traditional cutting and gluing of paper way, but this assignment did help to familiarize me with tools in Photoshop. I can also say that not having made a collage since childhood, this assignment reminded me of how creating something new form something old can be a good creative exercise.